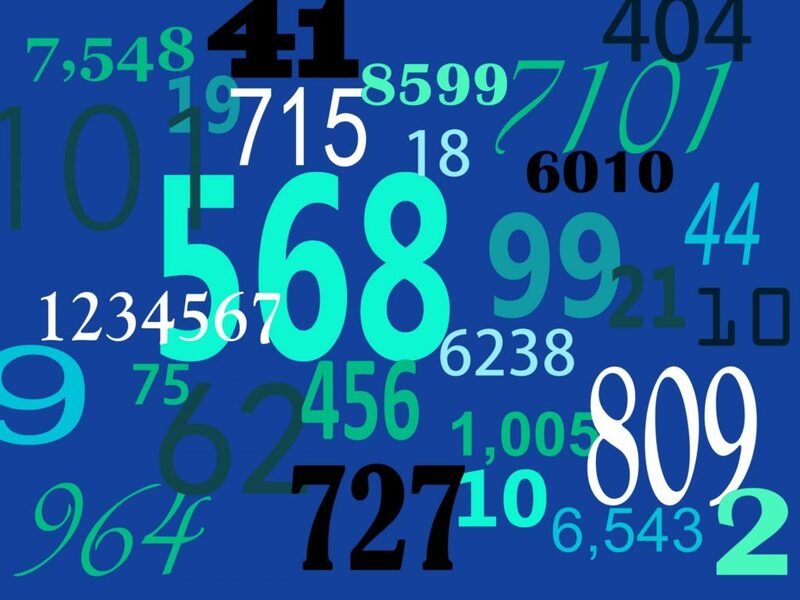 Which Numbers are Ruling Your Life Right Now? Get Your Weekly Lucky Numbers Here. name number This number relates to how you express yourself in the many outer experiences of your life. destiny number This number is dervied from your birthdate, and tells a lot about why you are here on Earth and what you are meant to accomplish. personality number This number is derived from the consonants in your name, and relates to the practical side of your life, such as career and personal relationships. soul urge This number is derived from the vowels in your name, and relates to the subjective, inner aspects of our lives. El Numero Uno knows what number comes before all others. One knows what One wants, and One knows how to get it. With single minded purpose, One definitely has the assertiveness and drive to get to the top. By seeing everyone and everything in relation to themselves, they know how to put their “resources” to good use. Consequently, there lies the challenge facing Ones, the need to realize other human beings are NOT “resources”. One needs to realize, that most people don’t like feeling “used”. Ones are strong and individualistic people, and naturally feel suited to seizing the reins of authority. Indeed, Ones can be very good leaders. Of course, they must remember to combine their natural ambition, and tendency to dominate, with a conscious respect. Ones need to have compassion for those who are less well endowed, with the single minded drive, and natural confidence, that only El Numero Uno has. With good natured kindness, tact, pleasantness, Two is a natural at playing a helpful and supportive role within a group. But, a retiring nature, and a natural diffidence, often leaves Two playing the role of “second fiddle”. However, the ability to create a pleasant home life, and supportive work environment, makes Two the leader others want to follow. Two’s quiet ways, and tendency to drop into the background, causes others to overlook their achievements, or underestimate Two’s potential. The challenge for Two is to speak up with their opinions and ideas. Ideally, Twos should not go home with a lot of “should haves” and “could haves”. Shyness and a tendency to nurse slights, can degenerate into an unhealthy secretiveness. Additionally, Twos can have a grandiose fantasy life, which can ultimately alienate others. Learning to step up to the plate and play ball, when it’s their turn to bat, will leave Two feeling like a winner! Three is the number of wholeness and completion. With an affable personality, a rich sense of humor, Three is all around likeable, popular with everyone they encounter. Three is a natural showman, with ocassional flashes of brilliance. Fields which involve teaching, selling and entertaining are a perfect stage for Three’s engaging and charming powers of persuasion. So what’s the downside of Three? Being too easy to like can develop into a preoccupation with shallow popularity. Additionally, a talent for entertaining can degenerate into cheap bids for attention. Finally, an ability to sell ice to the proverbial Eskimos can easily become a con game. Three’s challenge is to not allow their ample gift for engaging others to become shattered with complacency or egotism. Steady and stable, Four works slowly, to get things done the way they should be done. Like the fabled tortoise, Four keeps an eye on the long term goal, slowly but surely getting there, step by step. The slow progress of the Four sometimes attracts ridicule from the animated and quick moving “hares”. But at the end of the race, Four will spend the latter half of their lives enjoying their hard earned success, and carefully nurtured relationships. Fours must be alert to the fact patience can harden into immobility. Also, too much self control can turn into a stifled personality, prone to rageful outbursts of frustration. While making the slow but steady pace towards success, Four would do well to occasionally stop and smell the roses along the way. Five is drawn magnetically into the unexplained and mysterious. Like the 5 points of the pentagram, Five is a known associate of the occult and the magician. Fives are often fascinated with unusual beliefs, be they religious, philosophical, political, or artistic. Indeed, Fives are often found on the fringe, and are the motivating force of all “underground movements”. Certainly, Fives are richly represented in the fields of experimental art and music. They also populate obscure cults, research beyond acceptable science, engage in psychic research, and research innovations in alternative medicine. Fives are adventurous, lively, interesting and intelligent. Indeed, they are always willing to listen to another person’s point of view, no matter how unusual. Of course, this passion for the unusual can manifest as pointless weirdness, with no value beyond shock value. Not too fast, not too slow, not too hot, nor too cold, Six is usually just right. By taking the middle path, Six is rarely subject to any sort of extremes. In fact, a well balanced nature often makes Six a happy number indeed! Six prefers old friends to new, the familiar to novel, and the security of custom over the thrill of innovation. But in spite of all this apparent conventionality, Six is anything but dull or stuffy. Perpetually happy and optimistic, Six is loving, kind and capable of making lifelong emotional attachments. Six is a number you can trust and count on. Level headed self confidence, a cheerful disposition, and a stable sense of dependability often puts Six at the forefront of success. With happiness and all the good things in life comes so easily, Six is at risk of growing complacent. As a result, Six can take the gifts and blessings so easily won for granted. The Seventh Son of the Seventh Son is traditionally gifted with “second sight”, and so it is with the number Seven. A deep craving for inner knowledge is the driving force behind Seven, and Seven is often drawn to the esoteric. Gifted with both imagination and a capacity for deep thought, Seven has an unusually profound inner life. Philosophical and scholarly, Seven pursues the mysteries of inner space with a clarity often difficult to convey to others. Seven can become so absorbed in inner musings, the outside world can fade into the background. As a result, communication with others can suffer. The challenge for Seven is to articulate their original thoughts clearly. Otherwise Seven runs the risk of becoming withdrawn, and simply being written off as strange by others. Seven, let your inner light shine, as a beacon to the higher path. The tension of an endless loop is what holds Eight together. Also, the constant striving to stay ahead can make Eight feel constantly on guard. As a result, they are endlessly anticipating what the next turn of fate will bring into their hard working lives. Although Eight is endlessly striving to make gains in financial security and material comfort, the good things in life do not come easily. In fact, they are only won by an unremitting effort, that can leave Eight feeling anything but free. The concentrated effort required of Eight often has them on guard. As a result, Eight is always thinking, what might happen next? And what needs to be done to stave off the next disaster? The constant struggle can leave Eight feeling isolated and bitter. As a result, Eight can be sarcastic and rude to others. Eight’s challenge is to take the good with the bad, and to go with the flow. Eight must not become wrapped up into what others have, and appreciate the small gifts bestowed on them every day. Nine is a number of completion and achievement. Consequently, Nine’s usually get what they want out of life, if only they could decide what that is! Nine has an enthusiasm and exuberance for life. They tend to fall in and out of love with ideas, goals and people, faster than any other number. Nine’s passions include helping others. Indeed, they can apply themselves to social issues with zeal, often moving from one cause to another, as their focus shifts with the times. These ever evolving shifts in enthusiasm can give others the impression that Nine is a crusading eccentric. Often, Nine is like Don Quiote chasing windmills. Nine’s desire to help others, coupled with vague objectives, can create a meddlesome and bossy Nine, rather than an effective leader of social change. Nine’s challenge is to remain focused, on each project until it is brought to an effective completion. Eleven is a number elevated by idealism and truth. It is a number of revelation, inspiration and visionary power. Because of this, Eleven operates on a higher plane. Their love of justice and truth is likely to find it’s expression as an ardent force for positive social change. Empathic and compassionate, Eleven often feels more for humankind as a whole, than for individuals. As a result, the practical needs of individuals are likely to be put aside, in the pursuit of ideals. Although they may not always win the love of everyone they encounter, Eleven’s idealistic passion for truth will always win admiration and respect. Overall, Eleven is a fortunate number, and those under it’s influence are blessed with clarity of purpose, and ethics. Finally, they are blessed with an intelligent and focused mind, that can accomplish much good in the world. Twenty-Two is the culmination of all positive aspects of all preceding numbers. Twenty-Two has the energy on One, the likeable personality of Two, and the brilliance of Three. They have Four’s capacity for hard work, the adventurous nature of Five, and the reliability of Six. They have Seven’s rich imagination, the worldly experience of Eight, the idealism of Nine. Finally, Twenty-Two has the all encompassing vision of Eleven. Indeed, to fall under the influence of Twenty-Two is fortunate! Twenty-Two has the ability to draw upon resources normally not available to most. They also have the capacity to elevate the world around them. However, a Twenty-Two who has been seduced by “the Dark Side”, has the capacity to enslave all that falls under their influence, into serving their egotistical desires. Consult with a Psychic for Answers to Your Life Questions, or to Calculate Your Soul Mate or Twin Flame Compatibility. This entry was posted in divination and tagged numerology, numerology calculator, soul mate, soulmate, soulmate calculator, twin flame calculator.